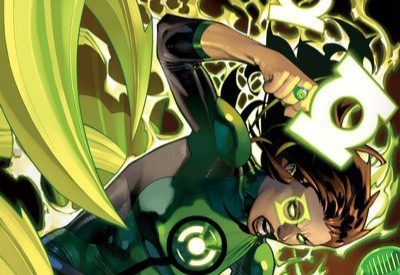 One of my bigger criticisms with Green Lanterns as a series has been it’s inconsistent art. Not terrible art mind you, but the constant changing of artists from issue to issue on certain occasions. So it was very nice to see that Mike Perkins penciled this issue as well. Similar to the previous chapter, Perkin’s pencils are perfect for the tone that Jurgens has firmly established, a darker unsettling tone. One in which neither reader nor Lantern will find any comfort. Besides his impeccable detail, I adore his facial expressions, as they allow the character’s personality to shine through without having the writer spell out what that particular character is thinking. I sincerely hope Perkins stays on longer than this arc, I am loving his gritty style on Green Lanterns.I still find that his Guardians evoke a certain height that seems to tall for my personal liking. Since this issue continues to deal with something that hasn’t even taken place yet, the villain seems generic. I’m sure that Jurgens has deeper motivations for this character, but as of two issues there is nothing captivating about this new character. It”s only a true criticism because one of the hallmarks for this series has been it’s multifaceted villains. I’m perfectly fine with evil characters being evil but there has to be something nuanced about them in order for them to make some sort of impact on readers, perhaps that will happen as this arc progresses. The one aspect that I believe is hurting my love of this title, is the lack of focus on Simon and Jessica. Having the new series shift from a more lighthearted series to gritty tone is a choice I don’t mind but when the stars of the series become part of a ensemble group then I take an issue. To Jurgen’s credit, both Simon and Jessica continue to retain their distinct voices but the magic that Sam Humphries and Tim Seeley had just isn’t channeling through Jurgen’s work. There are some really interesting ideas that Jurgens is bringing to the table, the big one of course involving Mogo generate a tremendous thunderstorm, something I can’t recall seeing in previous Green Lantern comics. I’m deeply curious to see where Jurgen’s takes the series as we go further into this arc. If there is one character that Jurgern’s seems to like writing the most is Guy. Jurgen’s isn’t doing anything different, but it’s more of a reminder of why we love Guy’s loud mouth.